Mitchell Wharf neighborhood on Daniel Island, home to some of the island’s most beautiful deep water homesites, is located near the banks of the Wando River. The name Mitchell is from the family who owned or worked the land from 1799-1877. In 1905 A.F. Young and Company purchased the surrounding land for $15,000. They converted the acreage from cattle ranching into truck (vegetable) farming. Though some of the produce was sold in Charleston, the majority of it was shipped to the North. The word ‘truck” comes from the English word ‘trukken,” which means to barter or trade without cash. This system was used for hundreds of years, depending on the economic climate of the time. The Charleston operation was called “Daniel Island Truck Farms,” and its first crop was produced in 1908. The primary crops were asparagus, cabbage, cucumbers, potatoes and beans. Corn and sweet potatoes were grown for livestock feed. At a time when it was difficult to find employment, this industry was the salvation for the locals – not only on Daniel Island but for those who lived as far away as Huger and McClellanville. At harvest time, workers were paid per barrel, bag or crate of the vegetable that was picked. Tokens were given to the field laborers, and at the end of the week, they would exchange the tokens for cash. 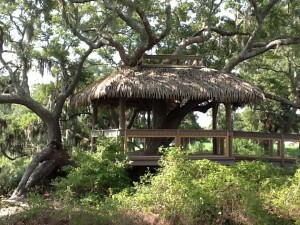 A pier and two packing houses were built near the Tree House area. A set of railroad tracks ran through the warehouses (where produce was sorted by size and quality) to the pier, where a daily barge would pick up the produce. Two additional piers were built along the Wando River to help expedite the shipping process. 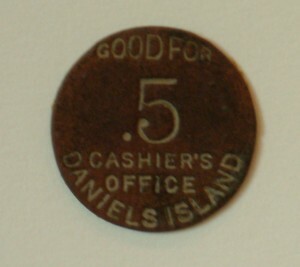 Acme Pier was located to the east of the present -day Family Circle Tennis Center, and Pole Grove Pier was located near the present- day Daniel Island Sales Center at the end of River Landing Drive. In 1921 American Fruit Growers acquired the property. The Mitchell Pier area was expanded to include: a general store, a post office, a school and houses for the manager of the store and the captain of the American Fruit Growers passenger boat, the Blue Goose. Truck farming continued on Daniel Island until 1945. The Blue Goose label was the trademark of American Fruit Growers and was the name of the company’s barge. 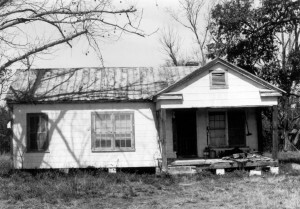 This was the home of the “Blue Goose” barge Captain during the truck farming era. The home was occupied by others until the 1990s and was removed in 1999. This wonderful Live Oak, with a circumference of nine feet, is located adjacent to the Tree House at the end of Smythe Street. It has been inducted into the national Live Oak Society. Though it was toppled many years ago, it is an excellent example of the resiliency of the Live Oak. Lying on its side, with its root system exposed, it has managed to send out “suckers”…bending and reaching toward the Sun…still green, still growing.